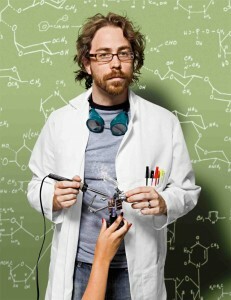 I first became aware of Jonathan Coulton when a friend of mine, Melora, took me to see him play in Hollywood. She had known Jonathan since they were in high school together and she figured because of my unwavering love of ‘Weird’ Al and Spike Jones (the singer, not the director, who spells his name ‘Jonze’, whom I also like..but anyway…), my knowledge of comics and other geeky stuff that I would really enjoy his music. She was right. 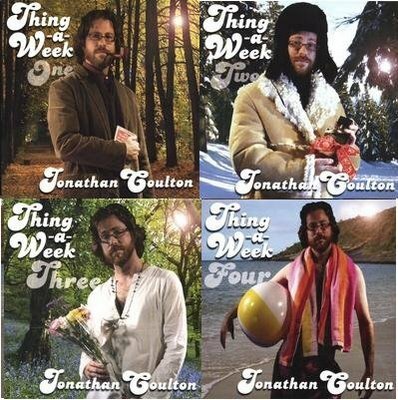 So, in the first interview in this new section that asks successful entertainment folks how they managed to, well, become successful, I’m thrilled to bring you words of wisdom from The Bard of the Broadband, The Fiend of Fractals, The King of Skullcrusher Mountain….Jonathan Coulton. Erin: When was your ‘light bulb above your head’ moment? Jonathan Coulton: I was asked to play a conference called PopTech, a get together of big idea people, tech CEOs, super scientists and the like. I was nervous about it because I had never played that kind of crowd before – I had recently been writing and playing for John Hodgman’s Little Gray Book Lectures, but this was a brand new audience who didn’t know me. But I did a couple of the geekier songs, and when I sang through the equation in ‘Mandelbrot Set’ the audience leapt to their feet applauding. That was sort of the moment for me, when I realized that there might be an audience who was specifically interested in the kinds of stuff I was already writing about. It was the first time I ever met the geek audience. Did you balance your 9-5 job with playing gigs and recording? I didn’t play many gigs at all, there wasn’t really any point to it because the audiences were so small. I know you’re supposed to play out and grow your audience, but that always felt really soul-sucking to me. And the writing and recording just happened in the cracks. When you don’t have kids, there’s actually quite a bit of time left over in the day and on the weekends. So it was like any hobby, I just did it when I had time and because I was interested. In a way, it can be more difficult to be almost-there-but-not-quite. Was that time as soul-crushing for you as it is for many people I know? What got you through it? It was very hard. Especially watching the web stats so closely as I did when I first started – I’d get a spike and I’d say “Oh, this is how it should be all the time, this is great,” and then within a couple days the spike was gone. And in some ways it’s harder to keep going after a success like that, it’s like a dangerously addictive drug. I went in cycles: I’d release songs until something hit big, and then immediately after I’d feel paralyzed and depressed, and for a few weeks I’d write stuff that wasn’t really that great. The only way to handle it was to look at long term trends and ignore the spikes as much as possible. With every spike, the traffic levels would settle down to somewhere slightly higher than before. And I was lucky enough that my wife was still working and fully supportive of what I was doing, so I knew I had a big chunk of time to fail or succeed or waste or whatever. At the other side there was either a workable career as a musician or a return to some kind of a day job, which was never really that bad to begin with. From ‘light bulb’ moment to being able to pay the rent with your earnings from your music, how long did that take? I remember about halfway through the year I had a month where I made enough to pay the babysitter who was watching my kid while I was pretending to be a musician. That was a real victory. I wasn’t exactly contributing to the family, but I wasn’t quite a negative anymore. And by the end of that year I was making enough to cover the mortgage and the babysitter and still have a little left over. The first year wasn’t hugely profitable, but it was big enough that I could see through to a sustainable income. Did you give yourself a time-limit? Like, “I’m giving myself 2 years and if it doesn’t work, back to the IT desk I go and I’ll jack it in.” Or do you think would you have continued at a more hobby-level? It was 6 months to start, we agreed we’d do that and see how it was going. If nothing at all had happened in that six months it would have been hard to keep going, but it was always promising to get better so I just kept going. I have no idea how long it will last, it’s entirely possible that I’ll run out of songs, or run out of people who want to buy them, and then have to come up with another plan. I had some of that even before I made the plunge and quit the day job. I had already released a CD and was selling it on CDBaby. Every now and then I’d get an email from some stranger, and I remember there was one (rare) live show where the audience was four or five friends and exactly one fan. That was one of the things that made me think I could quit the job and make it work, the idea that if some complete strangers liked what I was doing, maybe there were others. Who was the person (or persons) that were most important in your jump from ‘Code Monkey’ to ‘Internet Superstar’? I’m sure that the Hodgman connection helped a great deal. We’d been friends since college, and he was a few steps ahead of me in the “quit your job and get famous” plan. Just before I left my job, he had just published his first book and was touring around doing readings, and I came along and accompanied him on guitar, sang a couple songs, etc. Then suddenly he was on TV and everyone knew who he was. His book really took off, and the book tour started really drawing audiences and press. That was a hook on which to hang my brand new tiny fame as I started doing music full time. Doing your own Thing-A-Week, whatever it may be, could result in you telling your current boss to piss off somewhere down the line. Could you talk about the role Creative Commons played in your success? And, what exactly IS Creative Commons? Creative Commons is a way to license stuff you make – it sits on top of copyright and gives back some things that copyright takes away. Copyright says “All rights reserved” and Creative Commons says “Except for these” (and you get to define what they are). So my license allows people to freely trade and share the music, and to reuse it in creating something new, as long as what they’re doing is non-commercial. (Edit – Like the fan-made video clips in this article) It really is just a direct acknowledgement of the way people actually use music these days. And I know that it’s helped a lot, word of mouth from people passing the music around, plus plenty of exposure from videos, artwork, and new music that people have made using my songs. Creative Commons really helps music to circulate, and when nobody knows who you are you need as much circulation as you can get. What have been some disappointments thus far? Things that you would have liked to happen but didn’t. I have very little disappointments in how things have gone, it’s still amazing to me that I make my living this way. The internet has been pretty major in getting your work known. Could you talk about how it helped you at the start and where it’s gotten you? Also, has much changed in the interim? I never would have started if I didn’t see the internet as a way to start without working hard and risking a lot. I didn’t have the will or the time to invest in a lot of live shows to build an audience, and I didn’t have enough audience to interest any kind of label enough to invest in me. I was stuck there until I realized that I could cheaply and easily publish as much stuff as I wanted on the internet. Plus, maybe the internet would do the “growing my audience” part of it for me. I wasn’t sure that was going to work, in fact I thought it probably wouldn’t, but I had nothing to lose by trying. The interesting thing these last couple of years has been discovering that only a small percentage of the world actually uses the internet this way – there’s still a lot of juice left in old school media. That’s what I’m trying to puzzle out now, how to reach the people who don’t already buy all their music in iTunes. Having been at a few of your concerts, you sort of have the ideal amount of fame – in the venue, you’re famous, but on the street, you generally don’t get bothered. Could it be that you’ve cracked the ‘entertainment personality’ paradigm? It’s a pretty sweet situation – I get the occasional ego boost of feeling famous, but I don’t have to cover my child’s face with a mask when I go outside. I can’t say that it’s prevented me from becoming a little crazy, there are certainly situations where I get a small glimpse of what it must be like to be super famous everywhere you go. It would be very unpleasant I think. I don’t know what the sweet spot is because I’ve only come this far. It seems to me that there’s always someone more famous, more beloved, more wealthy, no matter how big you are. I’d love to be adored by millions and have so much money that I could never spend it all, but it’s not necessary to have that in order to be happy and fulfilled. I try to remember that, and I try to remember how lucky I am just to be making a living this way. What tips and advice would you give to someone interested in starting their career in the manner you have? Just start. That’s the hardest part, and it’s the thing that will help you the most. My friend Merlin Mann (Edit – www.merlinmann.com) has been thinking and blogging about exactly this for a while, and he’s got a lot of smart things to say about it. Now more than ever, there are very few REAL impediments to you making something and publishing it for the world to see – it’s cheap, it’s not technically complicated, you don’t even have to put pants on if you don’t want to. Just make something, and then put it out there, see what happens. In finish, talk about a random, happy highlight that you’ve experienced. I was out on a recent John Hodgman book tour. It was his second book, and we had been on the road for what felt like a long time. We were playing at a book event, in this giant convention center floor – the sound wasn’t great, and while the audience was huge it was hard to tell if they were enjoying us. We were also pressed for time on stage and had to cut a few things short, the whole thing felt very low energy, like we weren’t reaching anyone. And then John took some questions, which always loosens the audience up because he’s so funny off the cuff. One of the questions was from a little girl, maybe about 6 years old who asked “Are you guys going to do the zombie song?” John didn’t hesitate: “Yes we are,” he said, even though that was going to put us over time, and even though most of the audience had come to see him and not me. And I sang that song, suddenly not caring if I was pleasing the rest of the audience or not. There are a lot of those moments, and they remind me how incredible it is to make a connection with someone you’ve never met. Excellent. Loved the questions and the honest answers by Jonathon. Very inspiring, especially for some who are at the stage where maybe things are getting going but not quite there yet. Hmmm. I think I may know someone there. You Rock, Erin….soft rock, of course. This is just the lift I needed today! Fabulous interview! I didn’t know Jonathan’s work before now, but I am going to have “I Feel Fantastic” in my head for a week!!! Got here from JoCo’s twitter and found it a big boost. I’m not past the friends-and-family level yet but seeing things like this really helps. Thanks, and well done. P.S. : All about the Shop Vac. I’ve been toying with the idea of venturing beyond the cosy shelter of my stable, if slightly unfulfilling day job and this inspires me go a little deeper down the rabbit hole. I made the jump to full-time writer a while ago, and this year I’ve finally achieved a full-time income. Not a *great* income, but enough that I can continue to flip off The Man, at least for a while longer. 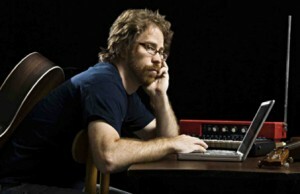 Jonathan Coulton’s story has been an inspiration. There’s nothing like getting up on a Monday morning and realizing you get to spend the day doing the work that makes you happy. So how does he make his living, though? Selling t-shirts and colouring books? Great interview, only just saw it now. Gives us all hope, eh?